I recently attended a training event held by White Rose to prepare students for our Researcher Employability Project, a compulsory month long project in which the student undertakes work experience at an organisation of their choice. During this day, a fellow research student introduced himself to my table using the line: “I’m doing a PhD in medieval stained glass… but I am capable of talking about other things”. This made a few people laugh with relief- it was an invite to not talk about our PhDs. The problem is that, as PhD students, we are going to spend at least three years of our lives on one, very tiny topic, which is likely to be either uninteresting to everyone but the researcher or completely impenetrable to people without previous training. Introductions between new PhD students inevitably involve the question “so what are you working on?” to which the answer is normally a series of prolonged ‘umm-ing’ and a pained expression as we struggle to condense our work into one sentence. The medieval stained glass researcher, however, had hit upon the ideal entrance line, and it also got me thinking about how vital it is to be involved in something quite different from your PhD topic. The Researcher Employability Project is one such way of broadening your horizons, and I’m enormously grateful to WRoCAH for being given the opportunity to gain invaluable skills and connections. As well as the potential for new experiences and creating post-doctoral possibilities for yourself, this allows you to take a break from your PhD before third year descends upon you. As WRoCAH students we are very fortunate to have this, however if you are not expected to complete such a project there is always potential for broadening your experiences. Universities are social hubs of activities which bring people together. Both of the universities I have attended have charity fund-raising societies for the philanthropic among you, sports societies (including ballroom dancing which is great fun! ), and societies specifically for postgraduates. Last year I became one of four students to restart the University of Leeds’ Postgraduate Society, which had fallen into stagnation due to the time commitments of the previous committee. From a membership base of about 8, we have expanded the society which now has over 200 Facebook group members, and is still growing. I’ve had such a good time revitalising this important part of postgraduate life, and I’ve met a whole bunch of interesting people through it. So far we have won our union pub quiz, organised an excellent presentation workshop which around 40 people attended, held socials, and organised trips out of Leeds for people who are otherwise stuck in the city. 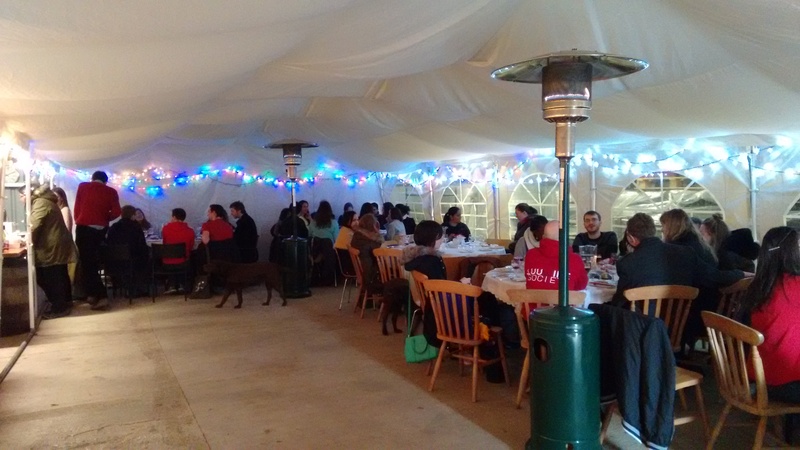 Postgraduate Society joined LUU Wine Society on their trip to Yorkshire Heart Vineyards. We had a fantastic day tasting wines and eating cheese! So try it out, do something that you can talk about apart from your PhD. You might make a friend, rather than a glassy-eyed acquaintance.